The GFW17 alumni shares with us what happened after she got scouted at the event, and how working at ASOS shaped her aspirations and career goals. We caught up with Alice Henfrey, a year and a half of her BA Fashion Design graduation. 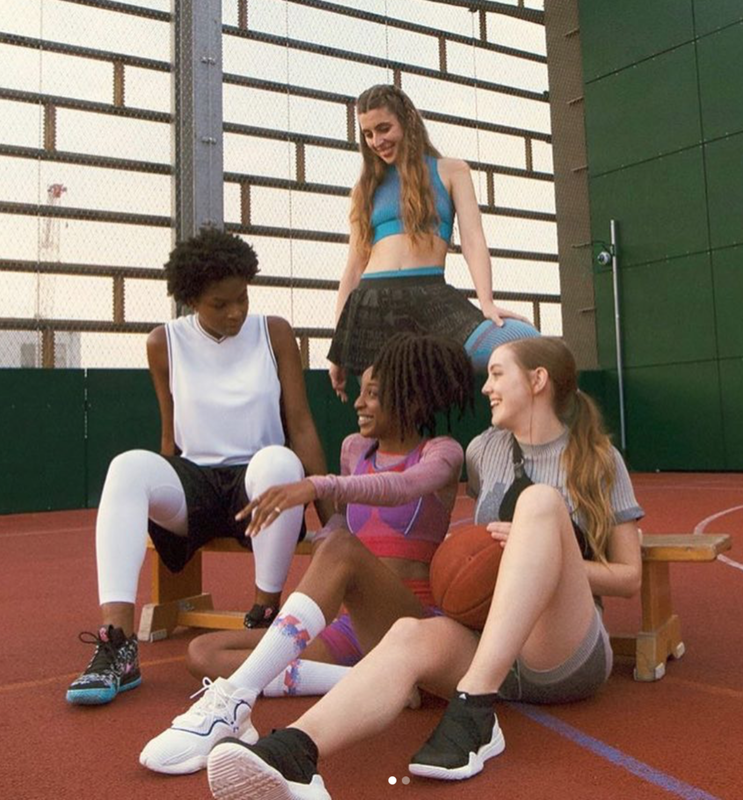 The young designer tells us how power of research and hard work was a fast-track into her Women’s sportswear design role at ASOS. Alice also reveals more about the creation of her final-year collection and how she built her impressive portfolio, which granted her a pass to her dream career. I attended The University of Brighton and graduated in 2017. The most valuable lesson I learnt there was the power of research. Brighton teaches a unique and individual approach to research, that has shaped me to be the designer I am today. Alongside this, completing the final year in my fashion design degree truly taught me the value of working hard. I spent countless sleepless nights, many tears and a lot of breakdowns- all resulting and adding to the person that I am today. Which area of the industry have you chosen to pursue, and what informed this choice? I am now a women’s sportswear designer at ASOS; this discipline greatly informed my final collection. For my graduate collection, I designed fourteen swimwear pieces that were tangled, wrapped and twisted together to form six looks. Layered over these were a range of jackets, pleated trousers and a two-piece tracksuit. All extravagantly feminine, decorated with laser cut trimmings and pleated elements. I now design active wear in the same aesthetic as my final collection. I focus on the fashion side of active wear and use the attention to detail and feminine style of my final collection to inspire the designs I create. Tell us a bit more about your career journey since showing at Graduate Fashion Week. I was fortunate enough to be scouted at GFW by multiple fashion brands. I interviewed for two different positions at ASOS- sportswear and swimwear. This involved two design projects and many hours of hard work. Active wear was the design team that chose me as their new assistant designer. Since joining ASOS I have been involved in the launch of 4505, designed a range of products in SS18 and am now in charge of designing the gym, run and swim lines. I have been given a lot of responsibility in the 4505 team, being one of two designers. I am thriving upon my position here and love the design freedom I get. In my graduate collection, I researched into 1900s sportswear and how garments have evolved since then. I took elements from Victorian gowns into this collection and designed my own ruffles and trims that I draped onto my sportswear pieces. At ASOS I constantly look back at historical active wear, whether it is finding silhouettes from 1930’s cricket kits to details in 1990’s cheerleading outfits. I find this a great starting point when designing active wear collections. Where are you hoping to be in five year’s time? I always planned to work at a high-end fashion company. However, since joining the 4505 team I now aspire to help grow and develop the brand into a leading British active wear name. In five years’ time, I want to have created a strong unique brand that truly stands out within this highly competitive industry. I want to work alongside the 4505 team and continue to design fashion focused active wear pieces. Tat the industry is undergoing change, with sustainability, diversity and responsibility becoming huge themes. Do you have any opinions on these movements? I agree that the industry is being hugely impacted by these changes. I believe that I am lucky to work at ASOS, a company that takes these changes very seriously. Since joining ASOS, I have been able to complete an eight-week course with the Fashion Sustainable Academy. This course taught me the impact designers have on sustainability- I have learnt what fabrics to choose, how to design for longer lasting garments and what to look for on supplier visits- this among many other elements. I have taken these skills into my design work at ASOS and am constantly trying to push and improve. I would advise them that Graduate Fashion Week is such an amazing platform to showcase themselves on. I was entered into three different GFW competitions and this is where brands scouted my work- without this I wouldn’t have a job. Final year is the one year that you can be free and design whatever you want without any commercial limitations- so be free and push it as far as you can go. Don’t be scared to design a collection that is a bit out of the box, as this is what gets you noticed in the industry.